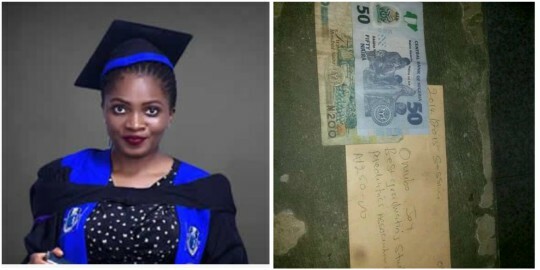 Joy Omubo, who made headlines after being presented with a N250 gift by the Pediatrics Association of Nigeria, after 2 years of graduating from UNIPORT, has disclosed that she's grateful for the gift.
" About the cash prize, I’m grateful for the gesture. I do not feel entitled to anything and nobody actually owes me anything, so I don’t feel sad. » "Injustice To The Best Graduating Student Of Usmanu Danfodiyo University Sokoto"